The FCLTX series free chlorine sensors feature amperometric measurement technology. They are designed for use in water treatment disinfection applications and for use with chlorine generators, pools, etc. The sensors are available in several ranges for detecting ppm levels of free chlorine. Choose the FCLTX-102 for 0 to 2 ppm, FCLTX-105 for 0 to 5 ppm or FCLTX-110 for 0 to 10 ppm of free chlorine. 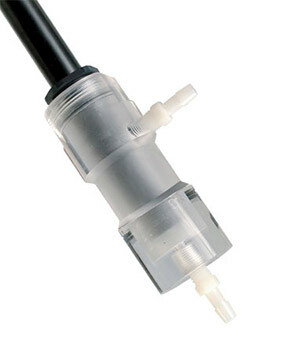 Membrane caps and fill solution are easily replaced to maximize sensor life. Sensors can be used in new installations with Omega flow cell or installed as replacement for other 4 to 20 mA output free chlorine (FCl) sensors. 참고: Comes complete with instruction sheet.